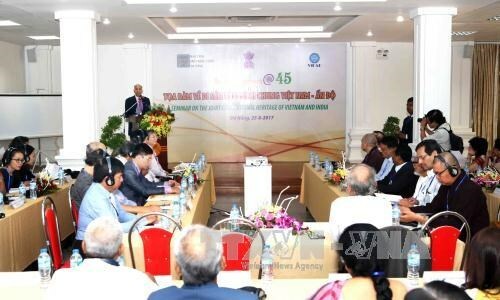 Da Nang (VNA) – The Indian Embassy in Vietnam and the Vietnam-India Friendship Association’s Da Nang city chapter jointly held a seminar on the joint civilisation heritage of Vietnam and India in the central city on August 25. Speeches delivered at the seminar focused on clarifying culture-related connection in the past between Vietnam and India, exploring each country’s efforts to preserve their cultural heritage, and improving public awareness of and responsibility for conserving and promoting the two countries’ joint civilization heritage. Director General of India’s National Museum B.R. Mani provided participants with an insight into the bilateral cultural relations reflected in architecture, sculpture and handwritings in India and the ancient kingdom of Champa of Vietnam. Venerable Thich Duc Thien, General Secretary of the Vietnam Buddhist Sangha, emphasised that typical Buddhist sites in the three regions of Vietnam, including Phat Tich pagoda in the north, the Dong Duong Buddhist Institute in the central region, and Buddhist objects found at Oc Eo cultural relic sites in the south, show connection with India’s culture.